Early June 2013—Early July 2013: Clinton’s server is relocated and then replaced by a new server, but the old server keeps running. After Platte River Networks (PRN) is selected to manage Clinton’s private email server on May 31, 2013, the company decides to immediately relocate the server and then also replace it with a better one. PRN assigns two employees to manage the new server (which will be the third server used by Clinton). The FBI will later redact the names of these two employees, but it is known that one of them works remotely from his home in some unnamed town and will handle the day-to-day administration of the server, and the other one works at PRN’s headquarters in Denver, Colorado, and handles all hardware installation and any required physical maintenance of the server. Media reports will later name the two employees as Paul Combetta, who works from Rhode Island, and Bill Thornton. The employee at PRN’s headquarters (who logically would be Thorton) works with Clinton’s computer technician Bryan Pagliano to help with the transition. Around June 4, 2013, this person is granted administrator access to the server, as well as any accompanying services. On June 23, 2013, this person travels to Clinton’s house in Chappaqua, New York, shuts down the server, and transports it to a data center in Secaucus, New Jersey, run by Equinix, Inc. This older server will stay at the Equinix facility until it is given to the FBI on October 3, 2015. The PRN headquarters employee (still likely to be Thornton) turns the old server back on in the Equinix data center so users can continue to access their email accounts. Then he spends a few days there setting up a new server. When he leaves, all the physical equipment for the new server is successfully installed except for an intrusion detection device, which Equinix installs later, once it gets shipped. Meanwhile, the PRN employee who works remotely (Combetta) does his remote work to get the new server online. Around June 30, 2013, this employee begins to transfer all the email accounts from the old server to the new one. After several days, all email accounts hosted on the presidentclinton.com, wjcoffice.com, and clintonemail.com domains are transferred. However, PRN keeps the old server online at the Equinix data center along with the new server to ensure email continues to be delivered. But the old server no longer hosts email services for the Clintons. Late September 2014: Clinton’s lawyers are sent the rest of Clinton’s emails so they can finish sorting them. In late July 2014, the State Department informally requested Clinton to provide all her work-related emails from when she was secretary of state. 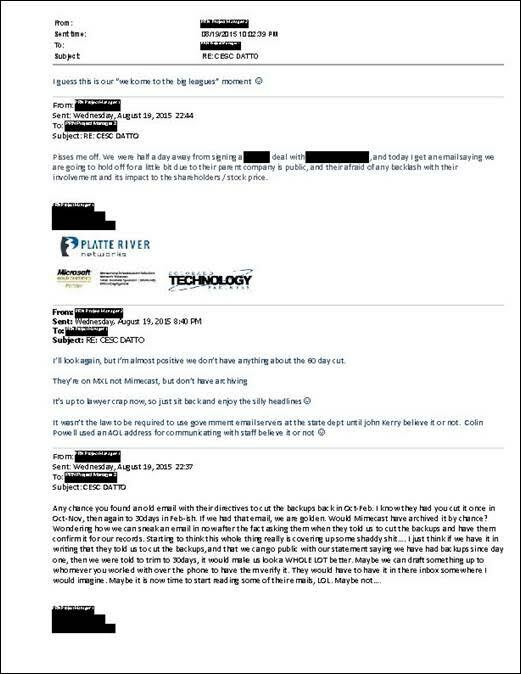 Cheryl Mills, one of Clinton’s lawyers (as well as her former chief of staff), then had Platte River Networks (PRN), the company managing Clinton’s private server, send her and Clinton lawyer Heather Samuelson copies of all of Clinton’s emails that were sent to or received from anyone with a .gov email address. Although the name of the PRN employee is unknown, the only two employees actively managing Clinton’s server at the time are Paul Combetta and Bill Thornton. Combetta sent the earrlier batch of emails in late July 2014. March 2, 2015: The company managing Clinton’s server tightens security on the server after its existence is exposed. On the morning of March 2, 2015, a front-page New York Times article reveals Clinton’s use of her own private email server. Platte River Networks (PRN) is managing the server. However, on March 4, 2015, an analysis of the server’s publicly visible settings will show it has a misconfigured encryption system. Further articles the next day will expose more security vulnerabilities. PRN will make more changes to improve the server’s security around March 7, 2015. August 12, 2015: The company managing Clinton’s private server is worried they will be blamed for a change of policy that results in the deletion of Clinton’s emails. The other PRN employee who has been actively managing the Clinton account with Thornton, Bill Combetta, responds that he believes the request was made to PRN by phone. August 19, 2015: An employee at the company managing Clinton’s private email server expresses concerns of a cover-up. Platte River Networks (PRN) has managed Clinton’s server since June 2013. Furthermore, PRN subcontracted with Datto, Inc. to make periodic back-ups of the server’s data. It has been claimed that Clinton Executive Service Corp. (CESC), the Clinton family company that hired PRN in June 2013, always made clear that there should be a 30-day deletion policy for the Datto back-up of the server. That means that any deleted email would be permanently deleted after 30 days. It’s not clear when the deletion policy for the Datto back-up of the server was instituted or changed. But if these employees are correct, the change would have come after Clinton was formally asked to hand over all her emails, which took place in October 2014. July 12, 2016: Congressional Republicans threatens subpoenas if the company that managed Clinton’s server fails to agree to employee interviews. Representative Lamar Smith (R), the chair of the House Science, Space, and Technology Committee, and Senator Ron Johnson (R), the chair of the Senate Homeland Security Committee, jointly author a letter to Treve Suazo, the CEO of Platte River Networks (PRN). PRN is the company that managed Clinton’s private server from June 2013 until late 2015. The letter notes that Johnson’s committee has been seeking to interview some PRN employees about the management and security of Clinton’s server since August 2015, while Smith’s has been asking to do the same since January 2016, but PRN has refused all interview requests. Apparently, PRN will still refuse to agree, because on August 22, 2016 these committees will issue subpoenas for the interviews. September 9, 2016: Congressional committees order five people involved with the management of Clinton’s private server to speak in a public hearing. Paul Combetta. He is a PRN employee. On September 8, 2016, the New York Times revealed that Combetta deleted and wiped Clinton’s emails from her private server, and he also got an immunity deal from the Justice Department as part of the FBI’s Clinton email investigation. Congressional committees issued subpoenas for PRN interviews on August 22, 2016, after asking without coersion since September 2015. Bill Thornton. He also is a PRN employee. The FBI’s final report indicated two PRN employees worked on Clinton’s server, so it seems probable he is the other one. Bryan Pagliano. He managed Clinton’s server until PRN took over. He was previously subpoenaed by the House Committee on Benghazi, but he pleaded the Fifth. However, he cooperated with the FBI after also getting an immunity deal. Justin Cooper. He is a member of Bill Clinton’s staff and helped Pagliano manage the server. September 13, 2016: Two former managers of Clinton’s private server plead the Fifth before a Congressional hearing; one other fails to appear at all. Bryan Pagliano, a former State Department employee who managed Clinton’s server while she was secretary of state. He defies the subpoena by failing to appear at all. Justin Cooper, a former Bill Clinton aide who helped Pagliano manage the server. He does answer questions for nearly two hours at the hearing. Paul Combetta, a Platte River Networks (PRN) employee, which managed the server from June 2013 until at least late 2015. He deleted and then wiped all of Clinton’s emails from her server. He fails to answer any questions and pleads the Fifth instead. Bill Thornton, another PRN employee who managed the server with Combetta. He also to answer any questions and pleads the Fifth instead. Pagliano’s lawyers have complained the hearing is politically biased and he will continue to refuse to participate. He has also failed to cooperate with another Congressional committee in 2015, a State Department inspector general’s investigation, and a deposition in a Freedom of Information Act (FOIA) lawsuit. Austin McChord, the CEO of Datto, Inc., was also scheduled to appear, but there is no mention of him. Presumably, he is rescheduled for another hearing.